The property is situated in the eastern portion of the Adirondack Park within the town of Moriah, Essex County, New York. 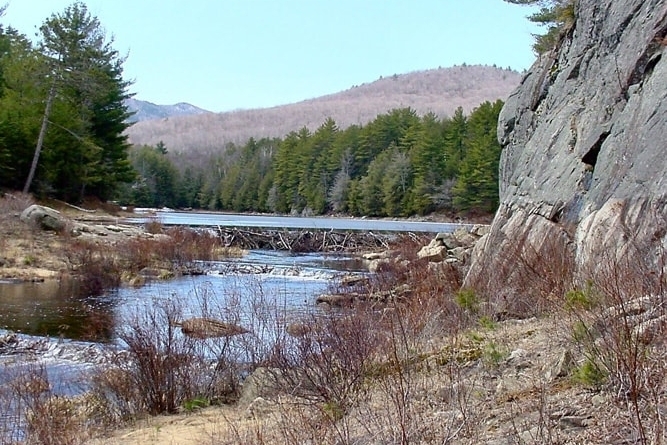 To the west of the tract begins the expansive, unfragmented Adirondack forest preserve lands that stretch toward the scenic High Peaks region, while Lake Champlain dominates the landscape to the east. Situated within a 20-minute drive of the Adirondack Northway (Interstate 87), the property is easily accessible from major population centers throughout the Northeast. New York City lies within a 4.5-hour drive to the south, Boston is approximately 4 hours to the southeast, Albany, NY is a 1.5-hour drive to the south, while Montreal, Quebec, Canada is roughly a 2-hour drive to the north. The property contains nearly 4,500’ of frontage along Route 4 (Ensign Pond Road), a paved, county road that links the village of Port Henry with I-87 to the west. This road enters the Adirondack State Forest Preserve just west of the property and vehicular traffic is minimal near the land. The road frontage provides several driveway opportunities among areas of moderate-to-steep slopes and rock outcroppings. Electric power and telephone service exist at the property’s northeastern corner. The property harbors many of the highly-desirable attributes central to a great retreat: private water resources, strong aesthetics, significant acreage and adjacent forest preserve lands. 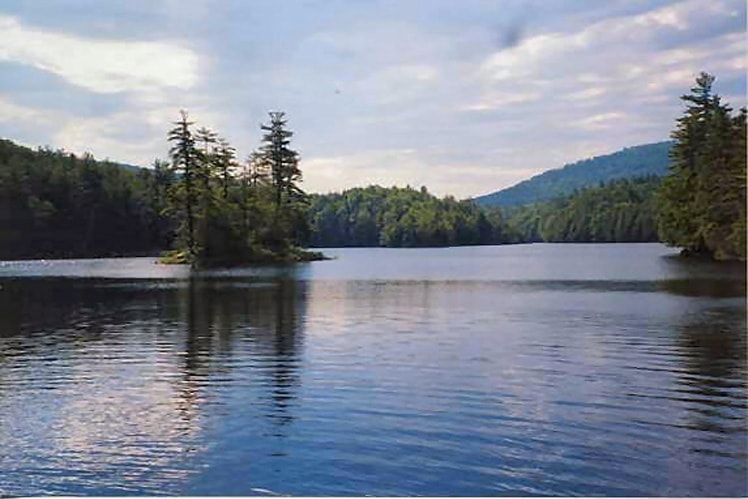 Its centerpiece is the 57-acre Tub Mill Pond, a compelling clear water lake located privately at the property's center. Tub Mill is a scenic beauty, offering spectacular mountain vistas, unbroken forested shoreline and granite outcroppings sliding to the water's edge. Its high water quality provides superior swimming opportunities while the lake's large size permits powered forms of boating recreation. A south-facing, exposed, level bluff at the lake's northern end offers an ideal home site, providing long views of the lake and its surrounding mountains. The current ownership has invested significant capital improvements into modernizing the dam at the outlet of Tub Mill, greatly stabilizing the lake's water level and outstanding aesthetic qualities. The property's water amenities and scenic terrain are complemented by a richly diverse northern forest ecosystem. Major commercial species include white and red pine, the maples, birches and hemlock. Near the lake, cathedral pines and hemlocks shelter undeveloped shorelines, providing a scenic backdrop while creating ideal walking conditions. Complementing these strong aesthetic attributes is a timber resource that is well positioned for value appreciation over the coming decade. With an attractive species mix, adequate stocking levels, and favorable diameter class distribution, the timber amenity represents a strong component of value to the investor. The property’s outstanding recreational and scenic attributes are enhanced by several water bodies in addition to Tub Mill Pond. 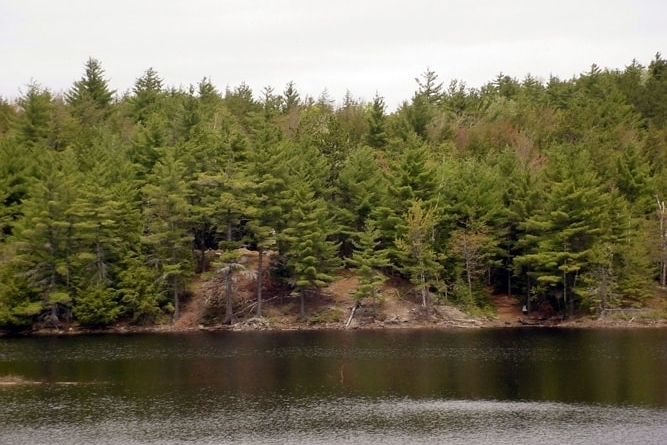 Jutting out to the east, Smith Pond (6 acres) is a narrow appendage of Tub Mill Pond. Its shallow waters provide habitat for a diverse mix of water fowl and amphibian species. Rockport Pond to the south of Tub Mill sits at a higher elevation and has mostly shallow water given its dam control valve is not currently operable. The water level of this pond fluctuates seasonally depending on the level of beaver activity. As Rockport drains into Tub Mill Pond, a scenic water fall cascades along granite rocks, forming a small stream before entering into the southern tip of Tub Mill. South of Rockport Pond, Upper Feeder Pond (currently 5-6 acres) lies half on the property and is suitable for canoeing and nature watching. Finally, the 7-acre Big Lock Pond lies west of Rockport and offers some of the best mountain scenery on the property, including Lock Mountain to the south and sheer granite cliffs to the west. After a long hike to this area, Big Lock is a great place to swim and fish. A recently upgraded, modern concrete dam is located at the outlet of Tub Mill Pond near the northwestern corner of the lake. Originally built several decades ago by the then power company owner, this structure extends for 50-60 feet and is 25 feet in height. The current ownership has invested significant capital into modernizing this dam to preserve the integrity of the property’s exceptional lake resource and to control the water level for swimming, boating and fishing. Following the recommendations of the New York Department of Environmental Conservation (DEC) Bureau of Division of Water and Dams, the structure was completely overhauled in 2013 by a local engineering firm and the pond’s ‘fill up’ is scheduled for spring 2014. Capital improvements include an entirely new concrete face, spillway, apron, control valve, catwalk and drain system.